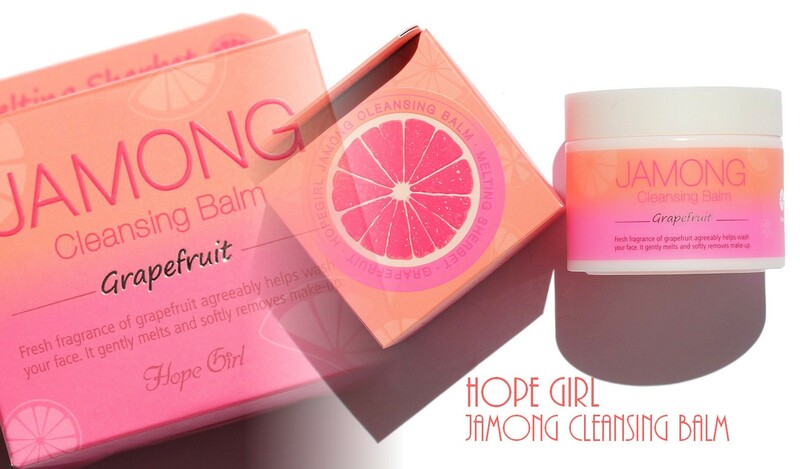 I've recently received a package from Jolse.com, my favorite store for Korean products, containing a cleansing balm from the brand Hope Girl. Hope Girl is a new brand they carry. It seems to be quite a young brand as I haven't found many reviews on their products even on Korean blogs. 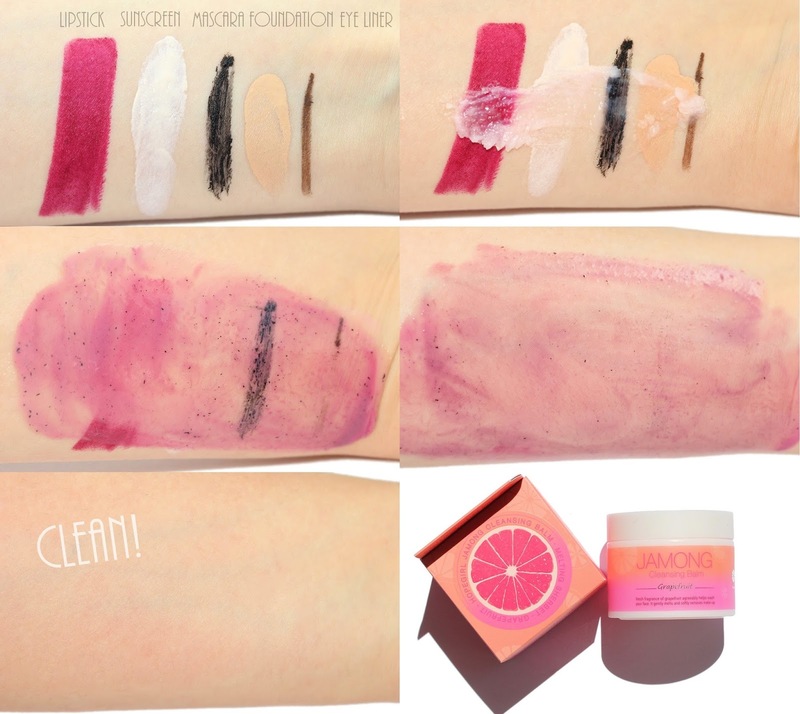 The brand has mainly makeup products but also a few skincare products. The product I got it is the Jamong Cleansing Balm! Jamong means grapefruit hence the super cute packaging with the grapefruit on the outer packaging and on the jar and of course, it also contains grapefruit. You know I LOVE cleansing products, especially oil cleansers, either liquid oils or solid oils, like cleansing balms or sherbets. So I was super excited to try this one! "Maintains the skin moist by cleansing even the thick point make-ups and waterproof make-ups smoothly. The hypoallergenic product cleanse the sensitive skin smoothly and mildly by excluding paraben, benzophenone, triclosan, triethanolamine, and BHT." 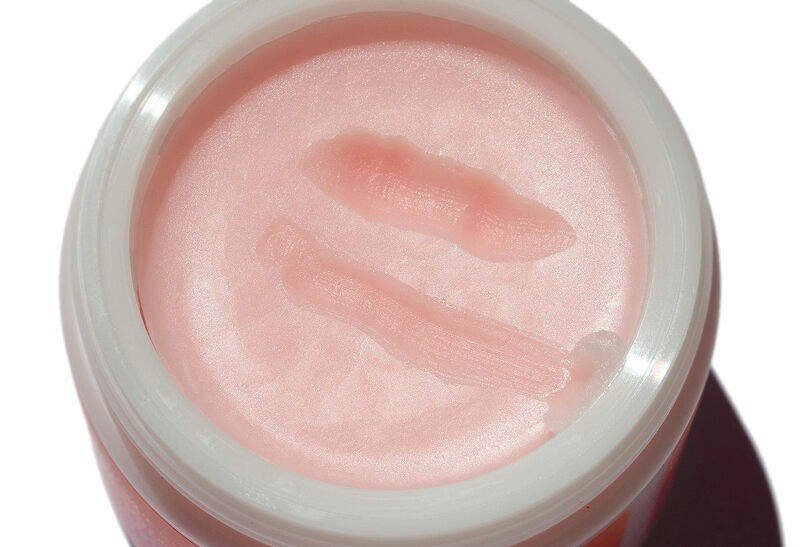 It has a real balm texture. It's solid in the jar but it transforms into a liquid oil when in contact with the skin. 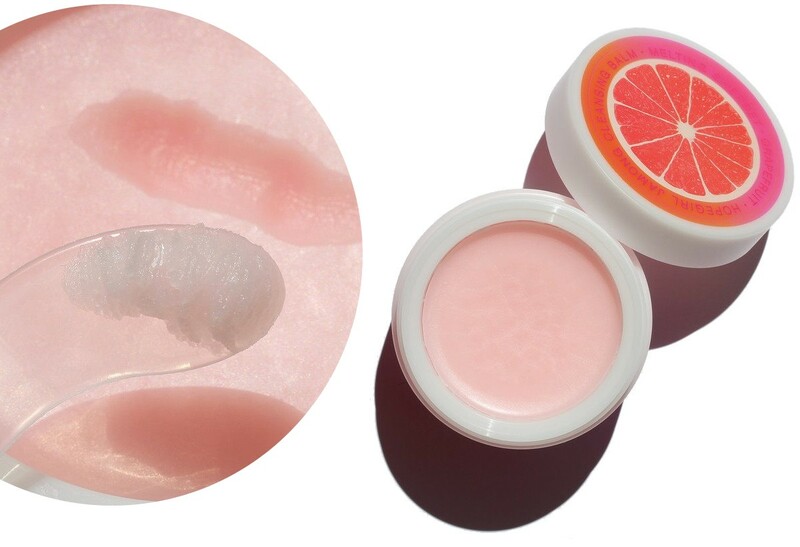 In the jar, it has a more solid appearance than Etude House Oremong One Shot Sherbet Cleanser for example and once it enters in contact with the warmth of the skin, it gets more sherbet-like and melts into a liquid oil. It emulsifies easily with water and doesn't leave any residues on the skin. Typically I don't need to follow with a foam cleanser. I've also used it to remove mascara and eye makeup, it didn't sting but it blurs the vision temporarily like all oil cleansers so I usually use it to wash my face (remove foundation and sunscreen) but not for the eyes (I do that with all my oil cleansers). As it's an oil cleanser, I use it in the evening. It comes with a spatula. Mineral Oil, Cetyl Ethylhexanoate, PEG-20 Glyceryl Triisostearate, Polyethylene, PEG-8 Isostearate, Orbignya Oleifera Seed Oil, Citrus Paradisi (Grapefruit) Fruit Extract, Citrus Unshiu Peel Extract, Citrus Aurantifolia (Lime) Fruit Extract, Citrus Limon (Lemon) Fruit Extract, Citrus Aurantium Dulcis (Orange) Fruit Water, Aspalathus Linearis (Rooibos) Leaf Extract, Aloe Barbadensis Leaf Juice, Olea Europaea (Olive) Fruit Oil, Macadamia Ternifolia Seed Oil, Citrus Grandis (Grapefruit) Peel Oil, Water, Tocopheryl Acetate, Glycerin, Phenoxyethanol, Caprylyl Glycol, Ethylhexylglycerin, 1,2-Hexanediol, CI 17200, CI 19140, Fragrance. It’s a mineral oil-based solid cleansing oil. Usually I like mineral oil based cleansers because they are safe for the skin and most people react well to it and it’s not sensitizing plus it removes makeup pretty well. Other ingredients are Cetyl Ethylhexanoate, an emollient that helps with spreadability, some surfactants to help remove makeup and cleanse the skin (PEG-20 Glyceryl Triisostearate, PEG-8 Isostearate) and a bunch of botanical extracts. These botanical extracts include Orbignya Oleifera (Babassu palm tree), olive and macadamia oils plus many different citrus fruits (grapefruit, tangerine, lime, lemon, orange) that are present to give a nice scent to the final product. These citrus derivatives can be sensitizing but as you wash them off, they are not really problematic in my opinion unless maybe you have very sensitive skin. Overall, I like this cleansing balm because it does the job, it removes makeup really well. It leaves the skin clean without residues and I don’t need to follow with a foam cleanser. It doesn't strip away my skin's natural oils, at least it doesn't feel dry after using it. I've been using it for about a month by the way. Hope Girl products can be purchased from Jolse.com (they offer free shipping and ship internationally). Link to the Jamong Cleansing Balm ($16.98, now $13.58 on sale). Thank you, Marina Rosie! It's indeed a great cleansing balm, I love how fresh it is and that it doesn't dry my skin plus that it removes makeup really well! I wish you a nice week! This sounds amazing - I love grapefruit so freakin' much!! Also, how beautiful are the colours on the packaging! That packaging is so cute! I love my cleansing products too - and I've been favouring the cream / solid cleansers of late. Great review! I love Korean cleansing balms so I will be putting this in my cart next time I visit Jolse!